British Columbia is one of the most prosperous provinces in Canada, yet poverty remains a serious issue in many communities. According to a new report released today, key indicators of poverty remain startlingly high in the Lower Columbia Region (LCR) of BC’s West Kootenay. For example, the four local foodbanks support approximately 5,000 visits per year. Additionally 1,600 households – 1 in 5 in the region – are in housing need, and in 2013, the last year for which there is reliable data, 990 children were living in poverty. 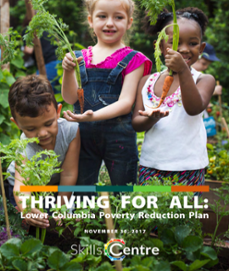 “Our new plan, Thriving for All: Lower Columbia Poverty Reduction Plan, is focused on delivering solutions to poverty in the area,” said Janet Morton, Executive Director of the Skills Centre in Trail. The eighteen recommendations in the plan fall into five broad themes: housing, food security, social, health and community services, learning and development, and a vibrant and inclusive economy. “One area that stimulated significant discussion was around affordable housing and the need for subsidized housing alternatives for low income households,” added Morton. The plan was developed with input from regional service providers, local business and industry, local government, and included a number of people currently living in poverty. City of Rossland Mayor, Kathy Moore, was an eager participant in the development of the plan. “As the mayor of Rossland and a participant in the process to create this poverty reduction plan for our region, I am very gratified to see it in its final form,” said Mayor Moore. “I am proud that the Lower Columbia region has taken a leadership role. It is past time to solve this issue”. Both Ms. Morton and Dr. Garner have recently been appointed to the newly created Minister’s Advisory Forum on Poverty Reduction. Thriving for All: Lower Columbia Poverty Reduction Plan is the culmination of a 5 year process involving conducting baseline research, workshops, and consulting with local governments, health, education, and social service providers, other provincial working groups, and local stakeholders (those who have experienced living in poverty). The report builds upon a number of other crucial collaborative projects conducted over the period including gender-based studies, regional living wage studies, and workshops exploring poverty reduction strategies from around the province of BC.